January 6 is Epiphany or Three Kings Day. It is traditionally thought to be the day that the three kings arrived to give their gifts and worship to the baby Jesus. But is that really the way it happened? Let us look at the events as told in the Bible. We’ll start in the book of Matthew where we are told about the magi. In chapter two we are told the wise men arrived in Jerusalem from the East. They asked around for the whereabouts of the One who was born King of the Jews. As you may suspect this caused an uproar in Jerusalem. Herod the king was a very suspicious and paranoid king worried that everyone was trying to take his kingdom away from him. When Herod had all the information he wanted he sent the magi on to Bethlehem. He wanted them to find the Baby, return to him, and tell him the location of the Baby. He would then “worship” the Baby, meaning he would kill the Baby. The wise men traveled on to Bethlehem and, following a star that led them on much of their journey, found the Baby and Mary, His mother, in the house they were staying in. They gave their gifts to Jesus and worshiped Him. We are not told it they stayed in Bethlehem a few days or traveled back home the next day. We are told that as they slept God told them in a dream to not return to Herod so they took another route back home. I am sure Herod had many spies. At least one of them would have told him that the magi left Bethlehem within twenty-four hours of their departure. Herod was furious that the wise men would defy his order. Then he sent his soldiers to Bethlehem to kill all baby boys two years old and under. It would not have taken the soldiers long to cover the five miles to Bethlehem. Now let us turn our attention to Mary, Joseph, and Jesus (Luke 2). When Jesus was eight days old He was taken by his parents to the temple in Jerusalem to be circumcised. After that they waited another thirty-three days. At the end of the thirty-three days Mary and Joseph brought Jesus back to the temple in Jerusalem to offer a sacrifice for Mary’s purification. That is a total of forty-one days after Jesus was born in Bethlehem that He was found in Jerusalem. If the wise men had already been to Bethlehem and left for home Herod would have known and would have been looking for newborn babies from Bethlehem, but He was not looking for Jesus at this time. Therefore, I believe that the wise men did not arrive in Jerusalem or Bethlehem until at least forty-one days and perhaps as long as two years after the birth of Jesus. The wise men traveled many days to worship the baby Jesus. They brought gifts. They are our examples. It is not enough to give gifts, to think about Jesus only at Christmas time. We need to worship Jesus and bring Him the only gift He really wants. Ourselves. The Christmas season in Mexico lasts about two months and is filled with traditions that have lasted, in some cases, for nearly five hundred years. Christmas was brought to Mexico by Catholic missionaries who brought the Christian faith to the natives of Mexico after it was discovered by Spanish explorers in the 16th century. In 1538 Fray Pedro de Gante invited all the Indians within twenty leagues of Mexico City to attend the first Christmas celebration. These Christmas masses and the parties and feasting that surrounded the celebration became so popular that Fray Diego de Soria in 1587 received permission to hold the Christmas masses out of doors. These outdoor Christmas masses were held nightly from December 16 to 24. As time went on the natives of that area added their own touches to the Christmas celebrations and art to make Mexico’s Christmas celebration what it is today. 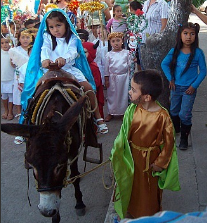 On or around December 16 families all over Mexico put up their nacimientos or nativity scenes. This is also the first of nine nights of posadas. The last night of posadas followed by a special midnight Mass occurs on December 24. After Mass finishes on the 25th of December families return home to a Christmas feast of turkey, tortillas, fried peppers, vegetables, fruits, candies, hot chocolate with vanilla and cinnamon, and a Christmas salad of fruit, nuts, beets, and sugar cane sprinkled with tiny colored candies. Other food items may be served as well or in place of these items as desired by the family. Children may get small gifts at this time, but they usually do not receive gifts until January 6. December 28 is El Dia de los Inocentes or Day of the Innocents. On this day children play tricks on their friends much like children do in the United States on April Fool’s Day. The people of Mexico welcome the new year with parties, fireworks, and lots of noise, games, and food. January 6 is El Dia de los Reys, the Day of the Three Kings or Epiphany. Children receive their gifts from the Magi, not Santa Claus, on this day. During the parties and feasting on this day a cake called La Rosca de Reyes or King’s Ring Cake is served. Baked in this cake is a small Christ Child doll. The finder of this doll has to host a party on February 2. February 2 is the last day of the Christmas season. Known as El Dis de la Candelaria or Candlemas, the day is filled with huge fireworks and partying. Each family takes the Christ Child from their nacimiento to the priest to be blessed before packing the nacimiento away for another year. Read more about Christmas in Mexico including some very unique customs here at CustomsOfChristmas.com. As we are now in the middle of the Easter season visit our sister site CustomsOfEaster.com to explore the origins of many of our customs of Easter.